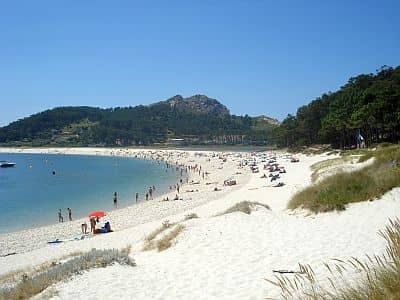 In the autonomous community of Galicia, located in north-western Spain, the climate is different from what is normally expected in Spain, in fact it is mild oceanic, with relatively mild, rainy winters and cool, quite sunny summers. In summer, short heat waves are possible, with highs around or above 30 °C (86 °F). In July 2013, the temperature reached 36 °C (97 °F) in La Coruña, 38 °C (100 °F) in Pontevedra and 39.7 °C (103.5 °F) in Vigo. The wind blows frequently, and can be stormy in the cold season, so there are several beaches frequented by surfers. Fog is also common: it can present itsfelf all year round, when there is no wind, even on summer nights. Snowfalls are only sporadic on the coast (where for example it snowed on the 10th of January 2010); they are still very rare (once or twice a year) in low-lying inland areas, while they are abundant in the mountains during winter. The rains are usually abundant, since they exceed almost everywhere 1,000 millimeters (40 inches) per year, while they are close to 2,000 mm (79 in) along the west coast and on west facing slopes. However, summer is the driest season, when the rains, though possible also in this season, are quite rare. In the interior, there are mountain ranges, where the climate gets colder with increasing altitude, and in winter heavy snowfalls can occur. There are also skilifts. The highest peak is Peña Trevinca, 2,124 meters (6,968 feet) high, in Serra do Eixe, while the altitude exceeds 1,700 meters (5,600 ft) in Serra de Queixa and Sierra de Ancares. The coast is indented, and there are coves (called rías) as well as islands. 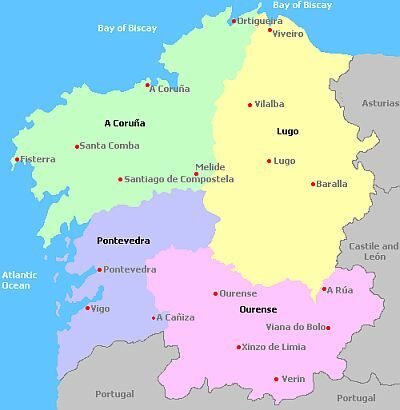 The most important islands are Illa de Arousa (inside the ría of the same name and in the province of Pontevedra), the Cies Islands (off the coast of Vigo, where the famous Praia das Rodas is located), and the Ons Island (slightly to the north, and west of Pontevedra). The most western point of Galicia and Spain is Cape Touriñán, just north of Cape Finisterre, which is traditionally (and wrongly) considered as the most westerly. Owing to both the dangerousness of the coast and the frequent storms, which caused many shipwrecks in the course of history, this westernmost part of the coast is called Costa da Morte (or Costa de la Muerte in Castilian). About fifty kilometers (30 miles) south-west of Santiago de Compostela we find a large sandy beach, called Dunas de Corrubedo, protected in a natural park. 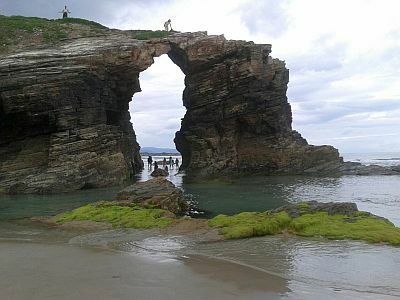 In the northeast, there's a beach, called Praia das Catedrais or Praia de Augas Santas, where you will find characteristic rocky arches. On the northwest coast, in La Coruña the climate is mild in winter, while in summer it remains cool: highs in July and August are just around 22/23 °C (72/73 °F). In La Coruna, approximately 1,050 mm (41 in) of rain fall per year; the wettest seasons are autumn and winter, the least rainy is summer: from June to August precipitation drops below 50 mm (2 in) per month, though on average it still rains for 6/7 days per month. The amount of sunshine in Galicia is good in the summer, when sunny days prevail, especially in the southern part (in July and August there are approximately 8 hours of sunshine per day in La Coruña and in Santiago de Compostela, and up to 9/10 in Vigo and Pontevedra), while in the other seasons, and especially in late autumn and in winter, the sky is often cloudy because of the prevalence of Atlantic depressions. Here are the average hours of sunshine per day in La Coruna. Further south, and in the interior, we find Santiago de Compostela, which is a bit colder both because of the distance from the sea and of altitude, and it's also rainier, in fact it receives nearly 1,900 mm (75 in) of rainfall per year. Lugo, located in the interior and at 450 meters (1,450 ft) of altitude, is pretty cold in winter, when night frosts are quite frequent, while in summer, while days are pleasant, nights are still cool. In Sarria, which is at no great distance from Lugo and practically at the same altitude, and it's often chosen as the starting point for the Camino de Santiago (or Way of St. James), the temperatures are similar. Here are the average temperatures of Lugo. In Lugo, the rain pattern is very similar to that of La Coruna: rainfall amounts to 1.115 mm (44 in) per year, with a peak between October and January, when it exceeds 110 mm (4.3 in) per month, and a minimum in summer. In the southwestern part of the coast, in cities such as Vigo, the climate remains cool enough; inside the rías, in winter the temperature is a bit lower than on the Atlantic coast, while in summer it is a little higher. Here are the average temperatures in Vigo. The rains on the coast exposed to the westerly winds are particularly abundant: in Vigo they reach 1,800 mm (70 in) per year, including more than 200 mm (8 in) per month from October to January; sometimes they reach spectacular values. But even here, in summer fortunately the rains diminish both in intensity and in frequency. Here is the average rainfall in Vigo. In Pontevedra, the climate is similar to that of Vigo. In the southeastern interior area and at low altitude, the climate is almost Mediterranean, and in summer it is quite hot: in Orense (or Ourense), 250 meters (800 ft) above sea level, highs in July and August reach 30/31 °C (86/88 °F), although nights remain cool. In Orense, precipitation drops below 1,000 mm (40 in) per year, and in summer the rains are quite rare. North-east of Orense, we find the Sil River, which gives birth to the canyon of the same name. The sea along the northern coast of Galicia is a bit cold even in summer, as you can see in the following table, regarding the temperature of the sea near La Coruna. On the west coast, the ocean temperature is practically the same, as can be seen from the data of Vigo. The best time to visit Galicia is the summer, from June to August or the first half of September, in fact it is the driest and sunniest time of the year. July and August are the warmest and less rainy months. However, sometimes it can rain also in midsummer, and some nights can be a bit cool on the coast, and a bit cold in inland areas. Those who don't like the heat, in order to avoid the albeit rare hot days, can choose the months of May (especially the second half), June and September (especially the first half), remembering though that it could rain more frequently. In the summer, on sunny days (which are quite frequent, especially in the south-west), you can take a break at the beach and sunbathe, with an air temperature often pleasant and a cool breeze from the ocean, but as mentioned the sea is cold for swimming.